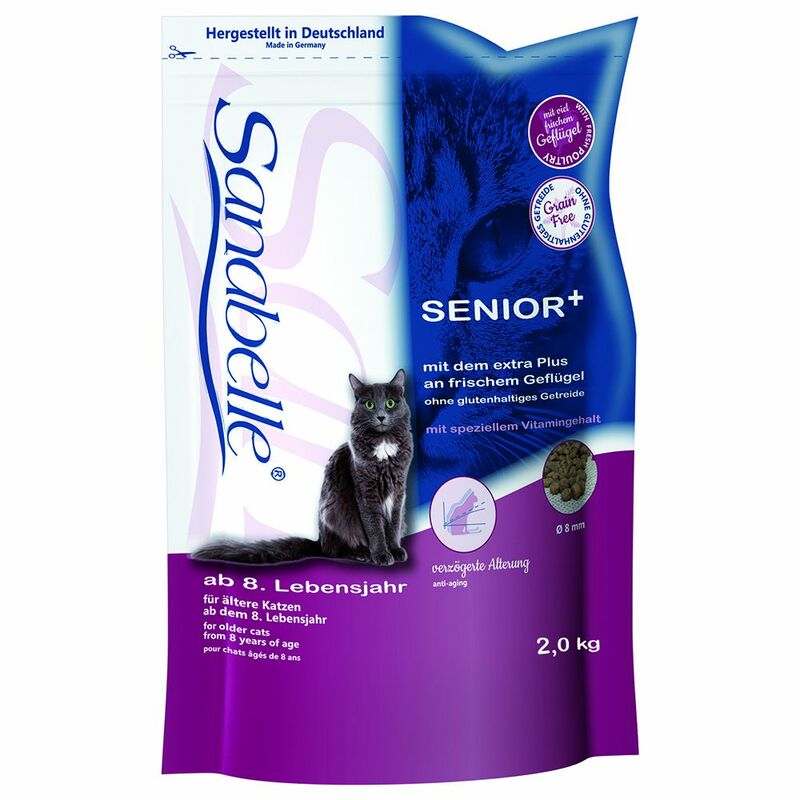 Sanabelle Senior dry food is specially adapted to meet the nutritional needs of older cats from the 8th year of life. As cats get older, their metabolism slows down, along with their levels of activity. This Sanabelle kibble has a reduced energy content, as well as lower levels of protein and minerals, with an increased proportion of fibre. Selected vitamins (e.
g. Vitamin A and Vitamin E) and antioxidants can help to support your cat's eyesight, and protect cells from free radicals, slowing down the ageing proceΒ. Older cats are also prone to kidney stones (struvit stones) and resulting kidney infections. This kibble has been formulated to aid water absorption and expulsion, and so help to prevent urinary problems from occurring. Fresh, palatable poultry gives the food a great taste and optimal levels of quality protein. This great tasting kibble also contains fish oils and linseeds which are rich in omega 3 and omega 6 fatty acids. The combination of zinc compounds (chelate), linseed, biotin and fatty acids, support a shiny coat and healthy skin. Sanabelle Senior is made without any artificial additives such as colour, aroma or preservatives. It is enriched with functional ingredients such as yucca extract, muΒel meat meal, dried chicory, marigold flowers, vitamins and minerals. These top quality ingredients have been carefully selected so that even the most sensitive cat will benefit from a delicious, nutritious meal with excellent absorption rates and digestibility. Sanabelle Senior at a glance: Balanced dry food, formulated for cats aged 8plus Reduced energy, protein and mineral content High in selected fibre Made in Germany Anti-ageing properties: A special combination of vitamins and antioxidants to help to protect cells against the ageing proceΒ Helps prevent urinary stones and other kidney problems by helping your cat to absorb and expel water With lots of fresh poultry: Very tasty, easy to digest source of animal protein Gluten-free grain: Carbohydrate from rice Supports a shiny coat and healthy skin: Contains omega 3 and omega 6 fatty acids in combination with effective organic zinc compounds (chelates), linseed and biotin With Yucca extract: To bind odours in the gut, and help to reduce unpleasant faeces odour in the litter tray With natural antioxidants: Vitamin E and the trace element selenium protect the body's cells against free radicals and help to slow down the ageing proceΒ Chicory: A natural source of prebiotic inulin which helps to prevent bad gut flora and supports good gut flora MuΒel meat meal: Rich in natural chondroitin and glucosamine which help to support and maintain bone cartilage Marigold flowers: With natural antioxidants which help to protect the cells and lutein which supports a healthy digestion and can lower blood sugar Taurine: With eΒential amino acids to support the immune system No: artificial colours, aroma, preservatives. No soya Extremely digestible: Excellent absorption and acceptability The..